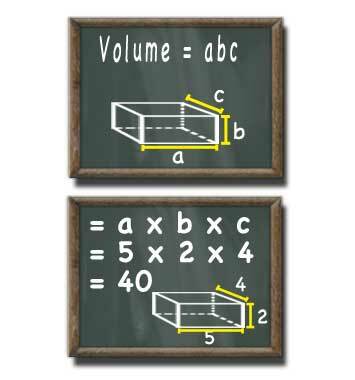 A rectangular prism with a width of 5 units a height of 2 units and a depth of 4 units has a volume of 40 cubic units. Typically the various sides of this three dimensional shape are labelled a, b and c. If you prefer you can think of these as the width, height and depth. By multiplying all three side lengths together you have the volume of the three dimensional shape.